Phoenix, Arizona could be the next place to establish the newest up-and-coming festival destination in the country. With Las Vegas hosting EDC‘s largest U.S. installment and southern California being the home of both Coachella and HARD Summer, it seems as only a matter of time before Phoenix taps into the festival market. The Valley of the Sun is preparing to host the first annual Phoenix Lights Festival on March 22nd, rounding off their headliner announcement with a star-studded cast of performers. The event’s inaugural bill will be lead by Hardwell, Robin Schulz, Route 94, Lane 8, and most recently confirmed, Canadian bass gods Zeds Dead. Although the full roster of acts has yet to be announced, Phoenix Lights is already promising a colorful variety of performances from some of dance music’s most sought-after performers. The newly announced event is promising to bring leading-edge designs, interactive art, and vibrant lighting displays to the mix. 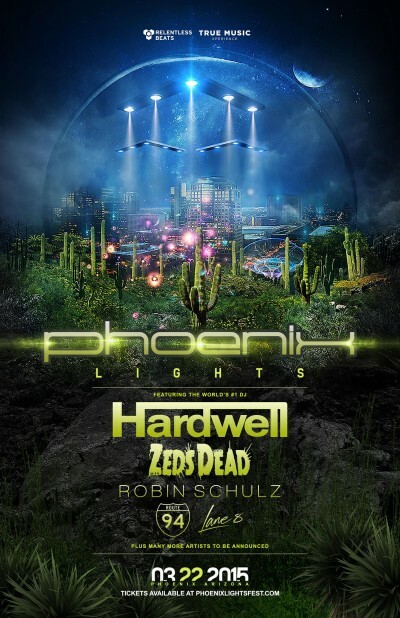 Lead by a very impressive list of headliners, Phoenix Lights is gearing up to deliver what could grow into the next big west coast event.